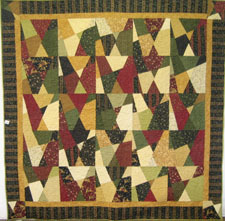 This quilt is a great one if you have a bunch of different fat quarters that look nice together, possibly from the same collection. For each fat quarter you will get a 15 inch block, so if you have 6 fat quarters, you will have a 30 x 45 inch quilt without borders, if you have 25 fat quarters you will have a 75 x 75 inch quilt without borders, and with 30 you will have a 75 x 90 quilt without borders. Just figure out what size quilt you want and that will tell you how many fat quarters you need. Eight inch borders look good on this quilt. For a queen size quilt, you will need 2 yards of fabric to make 8 inch borders.